Oil rigs, chimneys or antennae – a company's large infrastructure assets are typically remote and difficult to survey. This makes the tried-and-tested method of manual maintenance inspection a costly, time-consuming and sometimes even dangerous process. But with drones, it doesn't need to be this way. The principle is simple: Instead of a technician climbing up a chimney or wind turbine, why not use a drone armed with a camera to beam footage to an experienced inspector? Or better still, kit out the device with advanced visual and data analytics capabilities and let it assess the asset's status and maintenance needs itself. Unmanned aerial vehicles (UAVs) can access hard-to-reach places faster, cheaper and with less risk than manual inspections, and potentially allow the asset to remain on line. They may one day also be able to carry out maintenance. In this report, we outline the advantages of drone technology and provide a pathway for decision makers who want to harness its asset-inspection potential. We also show that first movers stand to reap the biggest rewards. In the past years, the public's perception of drones has been centered on their military applications. But commercial use of the technology is now on the rise. Our analysis shows that in 2017, the global commercial drone market was worth EUR 3.1 billion, with some three million units shipped. By 2022, the market value could hit as much as EUR 12.6 bn, with over 15 m units shipped. This boom is the result of growing recreational, business and research use. It's now common for real estate agents to take aerial footage of houses, for example, while conservationists use them to monitor wildlife. And who hasn't contemplated the thought of a journey in an unmanned drone taxi? In general, drones are expected to become prominent in all use cases that meet the so-called 4D criteria: dull, dirty, distant, dangerous. This makes them a great fit in the field of asset inspection, mainly in the energy and transportation sectors. 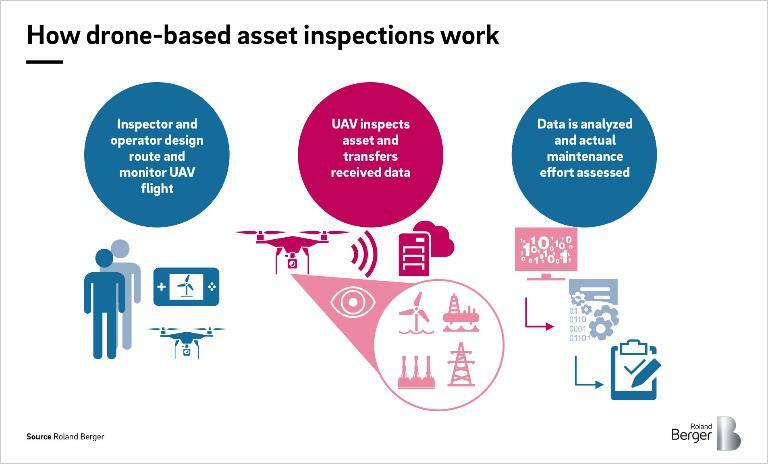 With cost pressure a growing concern among asset operators and industrial services companies, UAV-based asset inspection offers a new way to optimize cost and time savings, increase performance and quality, and thereby secure a competitive edge. The offshore oil and gas industry has already realized the potential to be had here. Total, BP, Shell, Statoil and others use drone-based unmanned aerial systems (UASs) to inspect their oil platforms, combining video and thermal imaging with advanced image recognition technology and automated data analysis. These have cut inspection times from eight weeks to five days while allowing operations to continue. 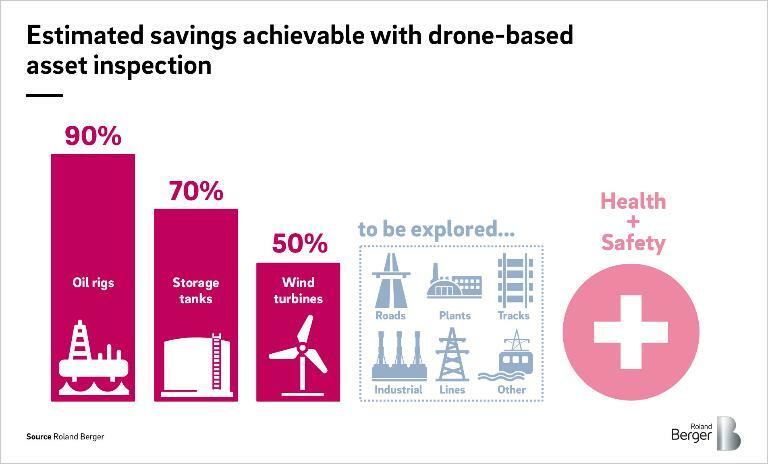 Based on this success, the industry has started to extend its use of UAV asset inspection to other infrastructure, such as plant chimneys. It is doing this in close collaboration with leading specialist firms like CyberHawk and SkyFutures. In such a nascent field, it's hard to put a figure on the exact savings UAV inspections offer. But we have learned from our work with asset operators and service companies that the potential is enormous: Costs for the inspection of an onshore wind turbine can be reduced by 50% per turbine, assessments of large cargo oil storage tanks can be completed several days faster than with manual methods, and chimney flue inspections, which traditionally require days of shutdown, can be performed in hours, with savings of up to 90%. And that's not to mention the reduced risk to personnel. With success stories mounting, it's likely that many more asset operators – from rail companies to grid operators and pipeline constructors – will introduce drone inspection technology. So we believe now is the moment to get on board. But while the potential of UAV inspections is clear, it is worth considering, as with any new technology, the challenges they present. The young market is highly fragmented, with the few established providers pitted against startups and all pursuing various hardware, software and service provision models: DJI, 3D Robotics, Yuneec, Parrot, AeroVironment, Insitu, Martek, Ambarella, and Lockheed Martin to name just a few. This makes it tricky to select the right partner. In addition, aviation authorities are still struggling to regulate drone use. While the US Federal Aviation Administration and the Single European Sky ATM Research Program (SESAR) are looking at the problem, much remains to be done, including on rules for beyond-line-of-sight operations. But such challenges also present opportunity, and demonstrate that the sector can still be shaped by larger players. By adopting the technology now, companies will be able to work with the technology pioneers to overcome obstacles such as limited battery lives, assist in the formulation of regulations and secure a competitive edge by being the first to make savings from drone-backed asset maintenance. Looking forward, first movers will have the best chance of unleashing the technology's full potential. They will quickly be able to become more data driven in an era when data is king and leverage their know-how into a new business model, perhaps even providing drone services to others. The prospect of future developments in UAV asset inspection also provides compelling reasons to act now. Advances in battery technology, for example, will enable greater and greater ranges, while new fuel cell, solar, tethering, and gas power systems could enable almost continuous operations. And with drones able to stay aloft nearly all day, improved computing capacity and artificial intelligence (AI) will enable them to perform real-time analysis. Growing computing muscle will also aid the development of so-called swarms of drones, which will call on AI to work together on increasingly complex tasks. And how about this all being done autonomously? That too could soon be a reality. Several companies are already pushing the technological boundaries here. These include SkyX, a Canadian firm that is developing an autonomous, self-charging drone for the inspection of North America's vast oil and gas pipeline network. So that leaves one key question: how can asset operators quickly exploit the potential of drones? We suggest a network-based approach that leverages existing market knowledge via a pilot project. The first step is to set up a small project team with a dedicated, empowered leader. This person needs to have the mindset to perform in an agile environment and the clout to push the project through. A top-level sponsor is essential. Once in post, the project leader should begin building a network of drone experts. This needs to encompass several areas. First, regulators and industry associations to help secure necessary licenses, as well as any publicly available funds. Second, established hardware, software and drone-based service providers to determine the current state of the market, available technologies (off-the-shelf or customizable), and whether any shortcuts are possible, for example via test runs with an existing service provider. Finally, startups and academia – this is where important developments happen and where top talent will most likely be found. Next, while continuing to build the network, the team should use intermediate findings to design (and continuously adapt) the pilot project. This would include selecting a drone model and payload (ideally off-the-shelf to save time), identifying suitable assets for a trial run, and defining a timeline and KPIs. The KPIs should include UAV-specific indicators as well as inspection-specific markers to monitor drone performance. It's important not to over-engineer the trial – the goal should be proof-of-concept rather than a finished product. After that, it's time to run the pilot. A key part of this should be agile monitoring of progress, with lessons learned compiled and fed back into the process. For example, has the UAV model proven itself, and does the process need refinement? The final step should be focused on expanding the project. The best course of action will depend on the pilot's results, but a set of core questions will underpin all scenarios. These include whether the company should build all inspection capacity in-house and develop knowledge independently, or whether it should partner with or invest in a startup, university program, or drone service provider. 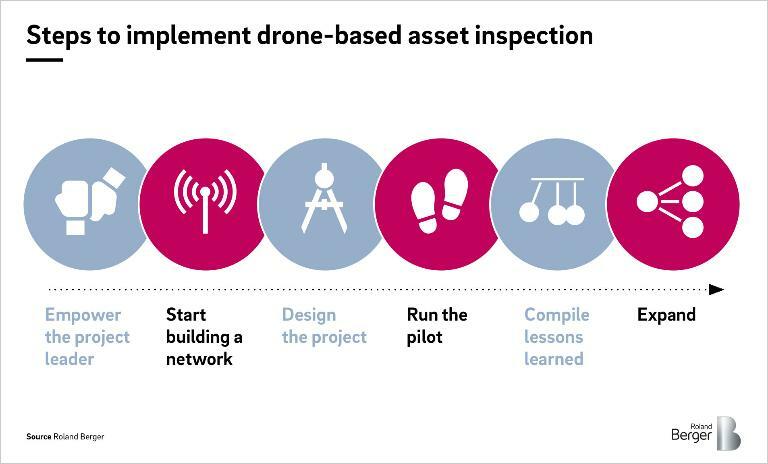 It's clear from the examples and successes outlined in this piece that drone-based asset inspection is likely to become the new standard in asset inspection. By getting on board now, companies have the chance not only to gain a head start on their competitors, but also to maximize savings. Perhaps more importantly, they could also help to redefine the asset inspection business model and become service providers themselves.